Book in the IDA IDEAS19 room block and save! Guest room rate includes GUEST ROOM INTERNET and PARKING up to (1) car per night. Reservations will be accepted based on availability through 5:00PM on Tuesday, April 9, 2019. You may also call 319.688.4000 and mention you are with the Iowa Dental Association. The beautiful Coralville Marriott Hotel and Conference Center is the site of the IDA IDEAS19 convention. Experience unparalleled standards of comfort and hospitality at this hotel, located in the Iowa River Landing area of Coralville. During downtime, venture on a short walk to nearby shops and restaurants at Iowa River Landing or take the complimentary shuttle service anywhere within a 5-mile radius. The Coralville Marriott features spacious guest rooms and suites with luxury bedding, flat-screen TVs and ergonomic workspaces. Throughout your stay, enjoy our hotel's surrounding walking trails, dining and drinks at Edgewater Grille and River Bar, refreshing indoor pool, 24-hour fitness center and Iowa Writer's Library, housing manuscripts from the country's oldest society of writers. Iowa River Landing is a remarkable, 180-acre mixed-use development located on Interstate 80 at Exit 242 (1st Avenue) in Coralville, Iowa. 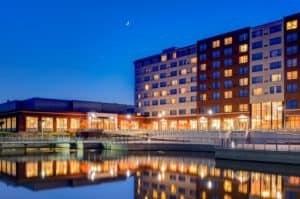 Perched along the Iowa River, Iowa River Landing is anchored by the 286-room Marriott Hotel and Conference Center and includes more than 330,000 square feet of retail, office, residential and entertainment space. It is also the home of The University of Iowa Health Care’s medical clinic, Homewood Suites, Von Maur, and many other retail, dining and entertainment offerings. In 2008 the City of Coralville received the EPA Region 7 Phoenix Award for its Iowa River Landing redevelopment project. This award recognizes the most promising and successful brownfields redevelopment projects across the region. The City of Coralville is located in Johnson County, Iowa, in the east central part of Iowa, just 75 miles west of the Mississippi River. The east corporate line of Coralville is the west corporate line of Iowa City. The close physical relationship between Coralville and Iowa City has been strengthened over the years by the presence of the University of Iowa. Founded in 1855, the University is the oldest and largest public educational institution in the State. Recent enrollment approximates 29,000 students. The University and The University of Iowa Hospitals and Clinics provide employment for more than 24,000 people in the metropolitan area. In 2016 the University of Iowa Hospitals and Clinics opened a new facility at the Iowa River Landing.